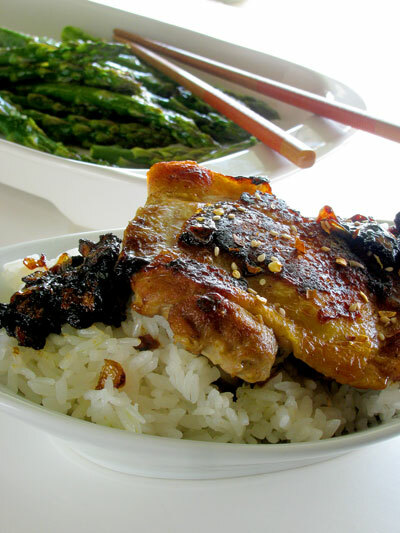 I love Chinese chicken recipes, in fact one of my favorite cookbooks is The Chinese Chicken Cookbook: 100 Easy-to-Prepare, Authentic Recipes for the American Table and I’ve made countless recipes from it. 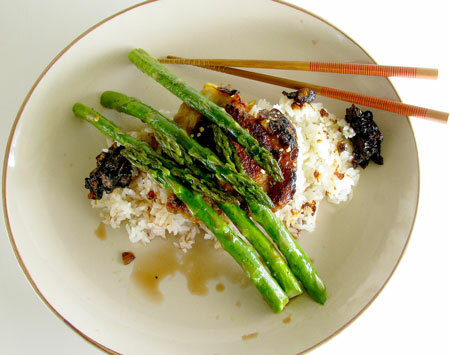 But this recipe is actually from one of the Chinese aunties I had in Hawaii. She made these salty sweet chicken thighs for a birthday party, and I begged for the recipe. Of course, I didn’t write it down, so it took some experimenting with quantities to get the right taste. But that’s how I love to cook! 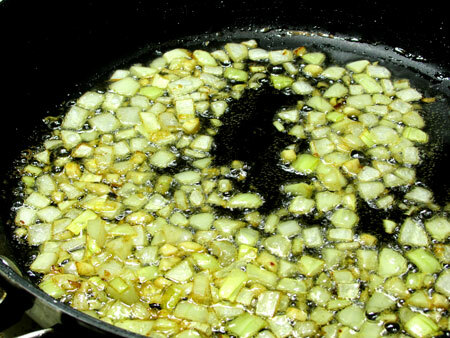 After browning the thighs, you take them out to slowly fry a TON of onions and garlic. Then you add a crazy salty sauce of chicken stock, oyster sauce, Chinese wine, soy sauce, and a little bit of brown sugar. If you taste the sauce before adding it you might freak at how salty it is, but once you add the chicken back in to simmer and the sauce thickens, amazing things happen! The onions begin to caramelize in the pan, then the sauce thickens and reduces until the onions clump together in a slightly charred sticky, salty, sweet mass of flavor. I served this with roasted asparagus drizzled with vinegar. Eric missed out on having it fresh, so brought leftovers to lunch yesterday. He came home singing my praises for such an amazing lunch! If you don’t have Shaoxing wine, you can substitute with a dry white wine or sherry. If you don’t want to use alcohol at all (see my post on alcohol) just increase the chicken stock in the amount of the wine, and add another tsp of brown sugar. It won’t taste the same but will still be delicious. Heat oil on medium in a large frying pan. 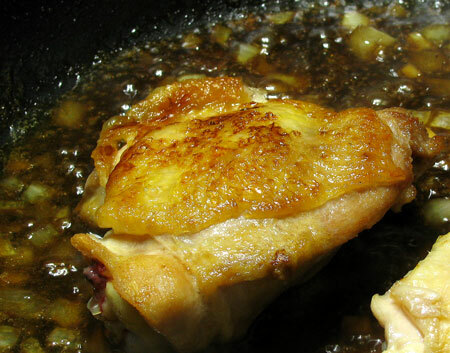 Add chicken thighs and cook about 3 minutes on each side until skin is golden brown and crispy. Use tongs to remove chicken to a paper towel lined plate. Add onion and garlic and fry about 5 minutes until onions and garlic are soft and golden. Mix stock, oyster sauce, wine, soy sauce, and brown sugar in a small bowl. Add the sauce to the pan and stir. Return the chicken to the pan, turning to cover it in the sauce. Cover the pan and simmer 15 minutes turning the chicken once. Chicken is done when internal temperature reads 170 degrees on a meat thermometer. Approximate cost/serving: It only cost $1.80 to make this whole meal! Can you believe it? That means just 45 cents a serving for a main dish! Gluten Free: Check your sauces. You can get gluten free oyster sauce and soy sauce. Strawberry Salad with Mint for Dessert, Snack, or Side Dish! I recently bought chicken thighs for the first time in my life (and I am on the top of the hill so to speak) because they were on sale. Now I know what to do with them – thanks! Love your photos! I can’t get enough asparagus this spring. I was just looking for a simple recipe to cook some chicken thighs tonight. I’m going to give this one a try. Thanks! Loved this recipe!!! Will definitely make it again over and over!!! I’m so glad Roxanne, thanks for stopping by and commenting! Made this for dinner tonight and it was delicious! I used boneless skinless thighs but that’s just cause I don’t like chicken skin. I also used sherry wine instead of the shaoxing because I didn’t have it. But it still tasted amazing! Will definitely make this again!